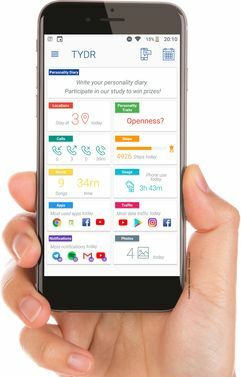 TYDR - Track Your Daily Routine - an Android app developed by the SNET chair, is now available in the Google Play Store. TYDR provides statistics about the daily smartphone usage. Additionally, the user can fill out questionnaires and see their personality profile. The research goal of this project is analyzing the relationship between smartphone usage and personality. We are currently looking for participants for a study conducted with TYDR. Participants need to fill out a multiple choice personality questionnaire every evening for 21 days. Participants can win one of forty 50 Euro prices.